These binoculars from Eagle Optics are designed to be versatile and affordable. 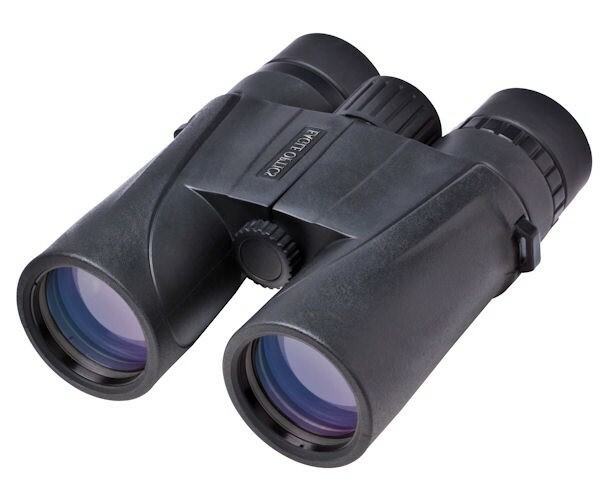 This pair is perfect for bird watching in the park or around the neighborhood while small game hunters will appreciate being able to clearly see their prey as well. These binoculars can also be used out on the water so you can keep an eye on your line and never miss a bite. This pair is also ideal for people that wear glasses with its ability to provide you with 17.6mm of eye relief. This means that you don’t have to strain your eyes, simply to use the binoculars. It is not uncommon to go bird watching in the early morning or varmint hunting at night, and these binoculars will ensure that you don’t miss a thing. The prism lenses are designed to increase the available light so you can easily see objects around you. The binoculars are also capable of a 341 ft field of view at 1,000 yards so you don’t have to worry about missing a rare bird or the small animal that is tearing up your property. You can also adjust the range up to 13.1 feet, so every detail is crystal clear. The multi coated lenses are water and fog proof so you will always be able to clearly see your surroundings. The coating also helps to maximize the light so images are brighter and clearer. Enjoy rich, true colors with the multi coated prism lenses, and always know exactly what you are looking at. For added convenience the eyecups can also be adjusted up or down which makes the binoculars more comfortable to use. This also makes it easier for you to zero in on a specific area, without having to constantly adjust the position of the binoculars. While these binoculars might only be intended for use around the neighborhood, the durable construction will allow you to take this pair with you almost anywhere. The rubber casing not only protects the binoculars, it also provides you with a comfortable and secure non slip grip. This can be especially important if you plan on using the binoculars with wet hands. There is a tight seal that prevents water from getting into the lenses, and you will also appreciate knowing that this durable construction is backed by Eagle Optics unlimited lifetime warranty. For added comfort the eye pieces can be adjusted so you can use the binoculars with or without your glasses. Not only are these roof prism binoculars priced to fit most budgets but this pair also comes with everything you need. There is a convenient carrying case that is perfect for storage, which will also protect them from damage when you are traveling. Eagle Optics has also included a protective rain guard and lens cover. The covers are tethered to the binoculars so you can easily uncap and cover the lenses as needed. The caps will protect the glass lenses against breaks and scratches, even though this is covered under the lifetime warranty. There is also a convenient neck strap included so you can have the binoculars close by and still keep your hands free. Eagle Optics has designed these binoculars to be versatile, affordable, and even comfortable for people who wear glasses to use. The lenses are designed to provide you with plenty of details even in low light settings. You will appreciate being able to clearly make out image details and colors with the Shrike binoculars. With its durable construction and comfortable design, you can easily use these binoculars almost anywhere. Everything you need for traveling and to keep the binoculars safe is included with your purchase. Some consumers have mentioned that the focus wheel can be difficult to accurately adjust. While this might be true for beginners, it simply takes a little practice before you are used to making tiny adjustments. If you are just starting out bird watching or simply need an affordable pair of binoculars to help you find an annoying varmint, these might be exactly what you are looking for. These are also one of the few pairs of affordable binoculars that are designed to be used with or without eyeglasses. With 8 times the magnification you can easily spot birds and other small animals, and you will also appreciate the prism lenses which ensures objects are bright and clear. The durable construction is designed to last through years of use, and you will also appreciate knowing that it is backed by Eagle Optic’s unlimited lifetime warranty. Since the lenses are fog and waterproof you never have to worry about your vision being cloudy, which also makes these binoculars great for use in a variety of situations. Lightweight, durable and comfortable, it’s not hard to see why these binoculars are a favorite choice with both bird watchers and hunters. You might want to check our best hunting binoculars guide.